The highly popular racing series from Namco continues on the PSP with Ridge Racer 2 that once again allows players to race in a variety of scenic locations as they compete for the ultimate racing trophy. What news in Ridge Racer 2? Ridge Racer 2 features a variety of gameplay modes that include Dual, Survival and Arcade with the dual being the most impressive addition that basically has the player challenging another opponent to the finish line. Survival is similar to that of Burnout where the player races against a set number of opponents with the last opponents being eliminated from the race. 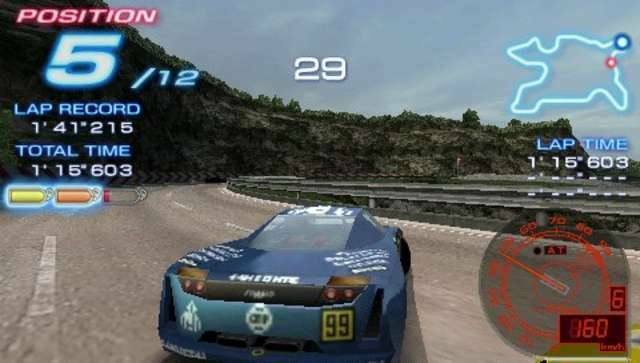 The control system of Ridge Racer is almost as its been made for the PSP with the d-pad and analog stick used in conjunction with the other buttons to navigate your vehicles through a plethora of obstacles. With that said, even if you’re not a racing champion, the novice gamer will easily pick the keys up to this title in a matter minutes. Graphically, Ridge Racer 2 is a visual treat on the PlayStation Portable that features state-of-the-art graphics which easily makes this game one of the better racing titles out there. The developers have done an amazing job at implementation a sense of speed as you race through the levels and various gaming environments. Match that with realistic car models and some highly detailed background environments with the odd special effect here and there that will give even the staunchest of gamers, little to complain about. As with graphics, the sound effects and musical scores of Ridge Racer 2 have been professionally implemented into the title. Whether you’re hearing the powerful sounds of your engine or your tires screeching around the corners, the impressive sound effects really help immerse you into this game. Musically, Ridge Racer 2 features your classic “pop” sound track and once again that famous commentator has returned to give you all the inside goss of street racing. In conclusion, Ridge Racer 2 is highly entertaining title on the PSP that will have most gamers playing for hours upon hours. With a sturdy gaming engine, great graphics and some heart-pumping sound effects, Rider Racer 2 is the perfect title to help you escape into a world of fast cars and dangerous racing. Check it out!